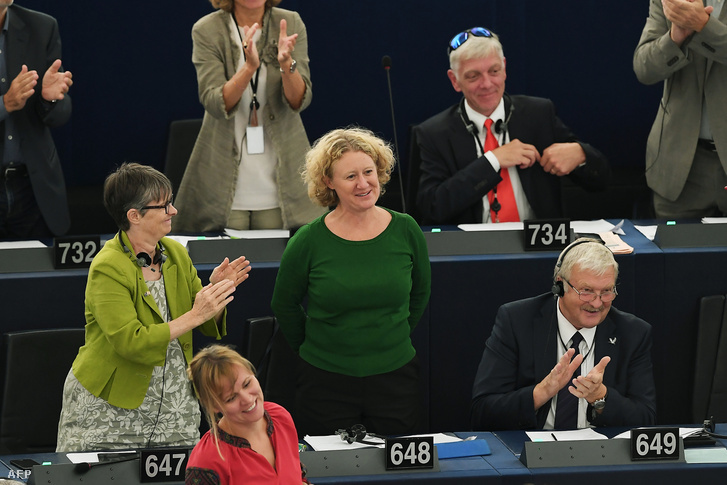 MEP Judith Sargentini receives ovation following the European Parliament’s adoption of her report on “the situation in Hungary” (photo: AFP). On September 12, 2018, Members of the European Parliament (MEPs) of the European Union adopted a resolution asking the Council of the European Union to determine if the government of Hungary has initiated measures and engaged in activity that present “a clear risk of a serious breach” of the fundamental values of the EU (source in English). This resolution was contained in a report articulating concerns about the state of democracy, the rule of law and civil liberties in Hungary submitted to the European Parliament (EP) by MEP Judith Sargentini of the Netherlands, a member of the Greens-European Free Alliance EP political group. The European Parliament’s endorsement of the so-called Sargentini Report was the second of three steps in the European Union’s warning mechanism specified in Article 7 of the Treaty on European Union. Article 7 of the Treaty on European Union (also known as the Maastricht Treaty), one of two main agreements upon which the EU is founded along with the Treaty on the Functioning of the European Union (also known as the Treaty of Rome), establishes mechanisms for the EU to warn and sanction member states determined to have violated the fundamental values of the European Union. Article 2 of the Treaty on European Union (TEU) specifies the fundamental values of the EU: “respect for human dignity, freedom, democracy, equality, the rule of law and respect for human rights, including the rights of persons belonging to minorities” (source in English). The European Union established the sanctions mechanism of Article 7 via the 1999 Treaty of Amsterdam that amended the Treaty on European Union (source in English). The European Union introduced this mechanism one year after beginning negotiations regarding accession to the EU with post-communist countries of Eastern Europe in order to provide the union with a means of penalizing these future member states if they reverted to authoritarian political practices in violation of the fundamental values stipulated in Article 2 of the TEU (source in English). The Article 7 sanctions mechanism represents the European Union’s most severe means of penalizing a member state. Suspension of voting rights in the Council of the European Union and the European Council (see “European Union Political Institutions” below) represent the harshest penalties that can be imposed on an EU member state via this sanctions mechanism. The European Union has no institutional mechanism for expelling a member state from the EU. The European Union established the warning mechanism of Article 7, known formally as the “preventative mechanism,” via the 2001 Treaty of Nice that again amended the Treaty on European Union (source in English). The European Union introduced this mechanism one year after the formation of a coalition government in Austria that included the Jörg Haider–led far-right FPÖ party in order to provide the EU with a means of warning member states found to be at risk of violating the fundamental values of the union rather than penalizing them via the sanctions mechanism (source in English). There are four European Union political institutions, all of which play a role in Article 7 procedures. These institutions are composed of two legislative bodies—the European Parliament and the Council of the European Union—and two executive bodies—the European Commission and the European Council. The European Parliament is composed of 751 MEPs distributed proportionally among European Union member states according to national population. MEPs are affiliated with eight different political groups that represent the socialist, green, liberal, conservative, Christian democratic and nationalist ideologies. The European Parliament is the equivalent of the lower house in a bicameral legislative system. The Council of the European Union is composed of one cabinet minister from the national government of each European Union member state who deals with the specific policy domain under consideration, such as foreign affairs, economic and financial affairs, agriculture, justice, etc. The Council of the European Union is the equivalent of the upper house in a bicameral legislative system. The European Commission is composed of one representative from each European Union member state and functions under the leadership of a president. The European Commission is the equivalent of a government cabinet and the president of the European Commission is the equivalent of a prime minister in a dual-executive system. The European Council is composed of the heads of state or government of each European Union member state. The European Council is the equivalent of a president or collective presidency in a dual-executive system. The Article 7 warning mechanism is composed of three steps: one, either the European Parliament (EP), the European Commission or the Council of the European Union must “determine that there is a clear risk of a serious breach by a Member State of the values referred to in Article 2”; two, the European Parliament must endorse by a two-thirds majority of votes cast and an absolute majority of all MEPs the finding of the EP, the European Commission or the Council of the European Union that such a risk exists; and three, the Council of the European Union must confirm the existence of this risk by a four-fifths majority in a vote in which the representative of the member state in question cannot participate (sources A, B and C in English). On May 17, 2017, the European Parliament adopted by a vote of 393 in favor to 221 against with 64 abstentions a resolution submitted by socialist, liberal and green EP political groups to trigger the Article 7 warning mechanism against Hungary (source in English). A total of 67 members of the European People’s Party EP political group to which the parties in Hungary’s governing alliance—Fidesz and the Christian Democratic People’s Party (KDNP)—belong voted in favor of the resolution, while 93 members of this conservative–Christian democratic political group voted against the resolution and 40 abstained (source in English). The text of the resolution, which stated that “developments in Hungary have led to a serious deterioration of the rule of law, democracy and fundamental rights over the past few years,” specifically requested that Hungarian authorities repeal the Law on National Education (Lex CEU) and withdraw the subsequently enacted Law on the Transparency of Organizations Supported from Abroad (the NGO Law). The resolution instructed the European Parliament’s Committee on Civil Liberties, Justice and Home Affairs to draw up a report on “the political situation in Hungary” to serve as the text for a subsequent EP vote to determine if there exists a clear risk that the country’s government will violate the fundamental values of the European Union. The European Union had never previously launched its Article 7 procedure—neither the warning mechanism nor the sanctions mechanism (source in English). On July 11, 2017, the European Parliament Committee on Civil Liberties, Justice and Home Affairs appointed Judith Sargentini of the Netherlands, a member of the Greens-European Free Alliance EP political group, as the rapporteur responsible for writing the report on the political situation in Hungary (source in English). On June 25, 2018, the Committee on Civil Liberties, Justice and Home Affairs adopted the report that Sargentini had written over the intervening period by a vote of 37 in favor to 19 against. Of the 37 committee members who voted to approve the report, 8 belonged to the European People’s Party (source in English). On September 12, 2018, the European Parliament approved by a vote of 448 in favor to 197 against with 48 abstentions a resolution contained in the Sargentini Report asking the Council of the European Union “to determine, pursuant to Article 7(1) of the Treaty on European Union, the existence of a clear risk of a serious breach by Hungary of the values on which the Union is founded” (source in English). A total of 115 members of the European People’s Party EP political group to which Hungary’s Fidesz-KDNP governing alliance belongs voted in favor of the resolution, while 57 voted against it and 28 abstained (source in English). On October 16, 2018, the Council of the European Union discussed the next steps to be taken in the Article 7 warning-mechanism procedure against Hungary. The representatives of Hungary at the meeting stated that the Orbán government would provide a “written contribution” to the issues raised in the Sargentini Report in accordance with the Article 7 stipulation that the council “shall hear the Member State in question” before deciding if it is at risk of violating the fundamental values of the EU (sources A and B in English). – and the stipulation of the 2018 amendment to the Fundamental Law that “designates many public areas as out-of-bounds for ‘sleeping rough’ and effectively punishes homelessness” (see Orbán Government Homeless Policy). On September 17, 2018, Minister without Portfolio in Charge of the Prime Ministry Gergely Gulyás announced that the Orbán government would submit a challenge to the validity of the European Parliament vote on the Sargentini Report to the European Court of Justice on the grounds that abstentions should have been counted as “votes cast,” thereby reducing the proportion of MEPs who voted in favor of the report to under the two-thirds majority required for its adoption (sources A in Hungarian and B, C and D in English). The Sargentini Report attacked the decisions, Fundamental Law, legislation and personal decisions that the democratically elected Hungarian parliament ratified within its own sphere of authority. With this, it [the report] transcended its sphere of authority and violated Hungary’s sovereignty. [. . .] We reject the slander contained in the mendacious pro-immigration indictment called the Sargentini Report. We reject this report which attacks Hungary because it did not admit immigrants, rejected the quota, built a legal border barrier and made the organization of illegal immigration punishable. [. . .] We call upon the government of Hungary not to submit to blackmail: reject the false accusations against Hungary and take legal measures against the fraudulently adopted report slandering Hungary! On October 16, 2018, the National Assembly adopted this resolution by a vote of 129 in favor to 26 against with 18 abstentions (source in Hungarian). All Fidesz-KDNP National Assembly representatives and four independent representatives who recently withdrew from the nationalist opposition party Jobbik voted in favor of the resolution, while all representatives from socialist, liberal and green opposition parties voted against the resolution and Jobbik representatives abstained (source in Hungarian). ¹ The European Union member-state rights that may be suspended via Article 7 are not specifically defined. Some argue that imposition of the Article 7 sanctions mechanism might also entail suspension of EU Cohesion Fund, Regional Development Fund and Common Agricultural Policy subsidies (source in English at bottom of page 4). ² The Council of Europe is a 47-member international organization that aims to uphold human rights, democracy and the rule of law in Europe and to promote European culture. It is not the same as the European Union, though all members of the EU are also members of the Council of Europe. Lajos Simicska was regarded as the most powerful oligarch in Hungary from the time Viktor Orbán formed his second government in 2010 until his dramatic public rift with the prime minister in 2015 (see The Fury of an Oligarch Scorned). Lőrinc Mészáros has supplanted Simicska as the most powerful oligarch in Hungary since the latter year. Following his rupture with Orbán, Simicska turned against the Fidesz–Christian Democratic People’s Party (KDNP) governing alliance and began to openly support the nationalist party Jobbik. On July 4, 2018, Simicska sold nearly all the companies under his ownership to his longtime business partner Zsolt Nyerges (source in Hungarian). The opposition newspaper Népszava reported that Simicska had sent his 26-year-old son, Ádám, to the United States to prepare the ground for continuing his business activities there (source in Hungarian). The term oligarch in its contemporary, Eastern European sense denotes a businessman (and rarely a businesswoman) who acquires significant wealth and political influence through his (or her) connections and allegiance to the government and uses this wealth and influence to provide the government with various means of support. Simicska was born in the city of Székesfehérvár (central Hungary, pop. 98,000) in 1960. He attended the same high school in Székesfehérvár as Viktor Orbán, graduating in 1979—two years before the future prime minister of Hungary. Simicska—as Orbán—subsequently attended the Loránd Eötvös University School of Law and Political Sciences in Budapest in the 1980s, though it is not known if Simicska graduated. While at the university, Simicska and Orbán both lived at the special residence hall for law students called the Bibó College (Bibó Szakkollégium). Simicska participated in the formation and early activities of Fidesz at the Bibó College, though was not among the 37 founding members of the party in 1988. 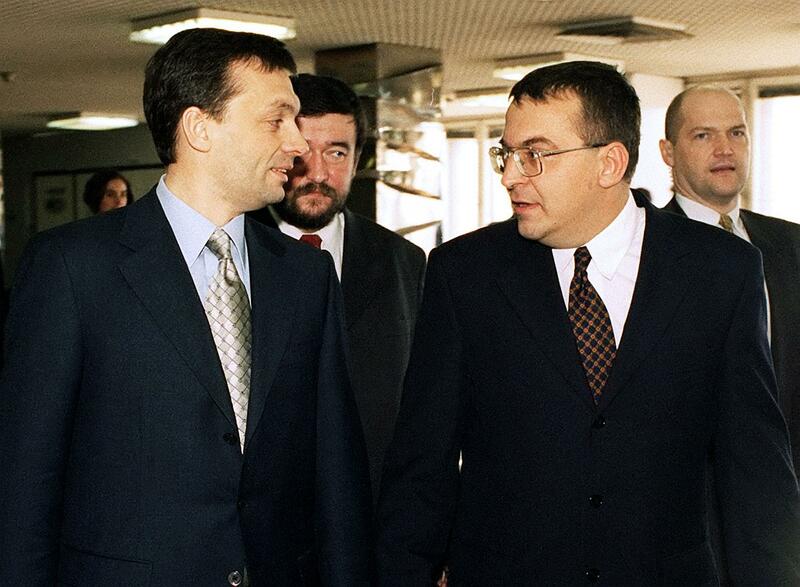 Prime Minister Viktor Orbán and ÁPEH President Lajos Simicska in March 1999 (photo: MTI). Simicska assumed his first formal political position in 1993, when he became financial director of Fidesz (source in Hungarian). He then served as president of Hungary’s internal revenue service ÁPEH for just over a year at the time of the first Orbán government in 1998 and 1999. 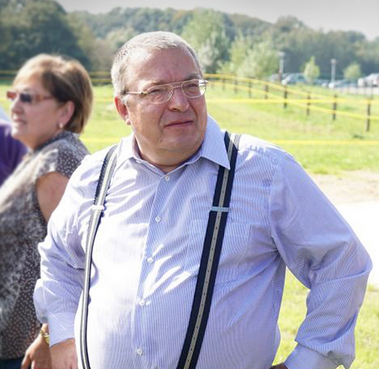 Simicska did not appear in public for a period of 15 years from the time of his resignation as president of ÁPEH in August 1999 until attending the official inauguration of an equestrian center in western Hungary in September 2014. The weekly Magyar Narancs published the first updated photograph of Simicska in over 13 years on the magazine’s cover in December 2012. Simicska spent the next decade quietly building an opaque business empire centered on the formerly state-owned construction company Közgép (“Public Machine”). Simicska was so secretive about his business activities that although it had long been speculated that he had acquired a majority stake in Közgép, definitive proof that he actually owned the company emerged only in documentation submitted as part of a public tender in 2012 (source in Hungarian). During this period, Simicska also acquired partial or total ownership over broadcast and print media including the news television station Hír TV, the radio stations Lánchíd Rádió and Class FM, the daily newspaper Magyar Nemzet, the weekly news magazine Heti Válasz and the weekday free sheet Metropol. These media explicitly supported Viktor Orbán and Fidesz. In addition to construction and media, Simicska focused his business activities on outdoor-advertising, primarily via the companies Mahir Cityposter and Publimont. Simicska attained immense wealth following the return of Viktor Orbán to power as prime minister in 2010, primarily through the large number of state construction contracts awarded to Közgép beginning that year. Közgép won 179.4 billion forints in public tenders from 2010 through 2013: 1.2 billion forints in 2010; 31.6 billion forints in 2011; 17.6 billion forints in 2012; and 129 billion forints in 2013 (source in Hungarian). Közgép’s revenue rose almost threefold from 44.8 billion forints in 2010 to 129.8 billion forints in 2014 (source in Hungarian). Simicska’s pro-Fidesz news media—Hír TV, Lánchíd Rádió, Magyar Nemzet and Heti Válasz— also began to generate significant profit during this period, much of which proceeded from government advertising. The aggregate post-tax profit of these four media nearly doubled from 876 million forints in 2012 to 1.7 billion forints in 2014 (source in Hungarian). Simicska was ranked the tenth-richest person in Hungary in 2015 with estimated wealth of 73 billion forints (source in Hungarian). He had not previously appeared in the annual Napi Gazdaság ranking of the 100 wealthiest Hungarians due to the lack of transparency surrounding his business operations.